Acrylic polymer & spray paint on primed duck canvas. Finished in satin gel medium. GammaProforma Presents: Cosmic Flush Exhibition, celebrating the life and work of the legendary Rammellzee. Rammellzee passed away in 2010, but before he left us he recorded his magnum opus, Cosmic Flush with producer Jonah Mociun. Unreleased, eight years have passed. The collection of breakcore and speed metal-influenced rap tracks stand as a futuristic relic which is just now about to see the light of day. Cosmic Flush fully realises Rammellzee’s complex philosophy and unique vision of futuristic hip hop, apocalyptic science fiction, and extreme sonic exploration. To celebrate the life of one of our culture’s great minds we are releasing Cosmic Flush as a commemorative series of records and prints. There are 7 core tracks, each will be reinterpreted and remixed by a visual and audio artist. Illustrating the groundbreaking influence and genius of the artist, The Rammellzee. 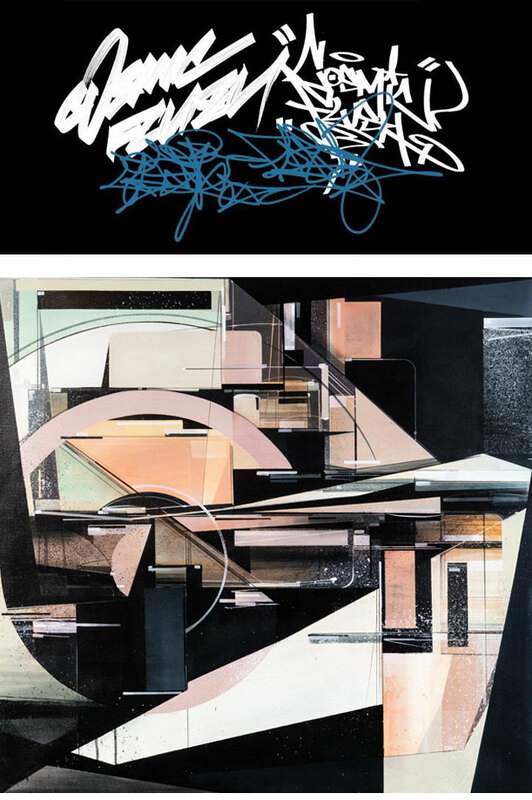 Works from Futura, Doze Green, Ian Kuali’i. Delta, sheOne, Augustine Kofie, Poesia, Toxic, Dr Zulu, Will Barras, Divine Styler, Mr Len, Edan, Beans and more TBA. View all of the paintings from the Cosmic Flush project and hear the album and remixes at Magda Danysz Gallery, London on Thursday 10th December, 2015. We’re producing a commemorative catalogue for the show which includes all of the artwork. A limited number of these are available to order here.